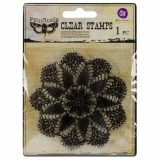 Vintage Vanity Clear Stamps 4"X4"
Vintage Vanity Clear Stamps 4"X4" - PRIMA MARKETING-Vintage Vanity Collection: Clear Stamp. Add a beautiful vintage design to your paper project using this stamp! This package contains one stamp on a 4x4 inch backing sheet. Available in a variety of designs, each sold separately. Imported.